ESVAGT’s new premises photographed by Poul Madsen, Profoto for Esbjerg County’s City Foundation. 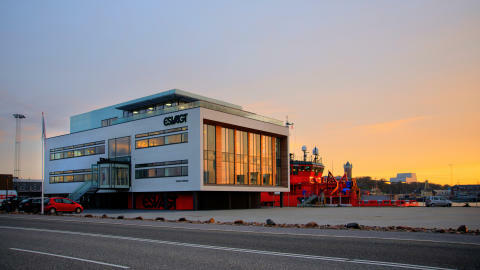 ESVAGT’s new premises on Dokvej has enriched the harbour of Esbjerg with a handsome building. ”A very handsome building that interacts with its unique location”. ”We are very pleased with the award and owe the engineers and architects our appreciation for bringing our request for a building with a maritime influence to life within a budget that was not an extravagant one. We have also had good tradesmen that have been dedicated to the job,” he says. 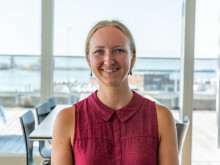 The City Foundation at the County of Esbjerg, Esbjerg Kommunes Byfond, advises and supports external renovations of preservation-worthy buildings in the County of Esbjerg. Awards are also given to good examples of new buildings or renovations. Prizes are rarely awarded to commercial buildings. Over the last five years only two other commercial buildings have been honoured; Jysk Landbrugsrådgivning, John Tranums Vej 25, Esbjerg in 2010 and SE, Edison Park 1, Esbjerg in 2013.